Hiding files and folders in Mac OS X has no direct easy technique, although there are some tricks which take a lot of time and users who are new to Mac OS can not do that easily. At this time, an application is very much helpful. 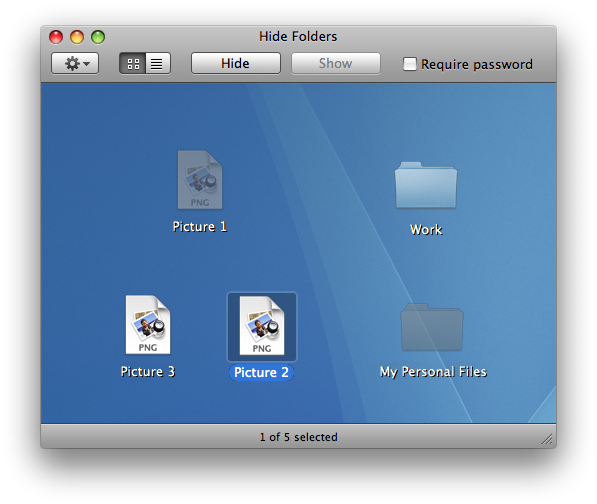 Hide Folders is a freeware program for Mac OS X dedicated to protect documents and folders. With a click, conceals files and folders with all their contents. The program is simple and natural to use because it works just as you are used to do things everyday with your Mac. With this program you will protect your files avoiding them to be being modified, seen or erased by other users. The free version has no option of requiring a password to open a hidden file or folder, but the Pro version has an option where people have to enter the computer admin password to open a hidden file or folder. Check and download Altomac Hide Folders at this page. You can try out this one: MacPaw’s . It even supports password protection.